BUENOS AIRES — La Nación (Conservative), Argentina, Nov. 2: As of last night the F.T.A.A. [Free Trade Area of the Americas] continued to be the virtual rough spot for the Argentine representatives who are involved in negotiating the final document. The reason for the slow progress in working out an agreement on whether or not this issue is to be mentioned in the final document and the way in which such a reference might be made is the conflicting desires of Venezuela and the United States, which are at opposing ends of the spectrum on this issue. The ideal situation for Venezuela would be for the A.L.B.A. [Bolivarian Alternative for the Americas] to replace the F.T.A.A., the U.S. plan that Hugo Chavez and his people consider “dead.” But the ideal in the view of the United States would be to have the document contain an explicit commitment on the part of the 34 countries of the hemisphere to resume — and if possible by a precise date — negotiations to get the F.T.A.A. started … The Bush administration observed that the region had grown without generating much employment and it laid the blame on “the politicians” who had instrumented the Washington Consensus. [President] Nestor Kirchner retorted that Argentina had reduced unemployment by a third in three years, and he laid the fault for what happened in the 1990s on “the policies” of that Washington Consensus. CARACAS — El Universal (Centrist), Venezuela, Nov. 2: The IV Summit of the Americas represents for President George W. Bush a valuable chance to improve relations with his Latin American neighbors. According to the news we get from the North, during the summit, Mr. Bush will insist again on his thesis of free trade, F.T.A.A. and bilateral F.T.A. [Free Trade Agreement] as fundamental instruments to create jobs, to fight against poverty and to strengthen democratic governance in the hemisphere. But concentrating on these proposals, necessary though insufficient, will only provoke more criticism, street demonstrations, polarized positions and another weak final declaration as a result of this summit. Bush could, for example, try to mend fences; to show willingness to dialogue and a serious commitment with issues of interest for Latin Americans, such as the migratory agreement with Mexico, the region’s external debt, protectionist practices, etc. He could also carry out his promise of social investment made in the 2004 Summit of Monterrey in order to alleviate poverty and inequity in the hemisphere. Only by doing so could he help achieve the desired and necessary rapprochement with his democratic counterparts and the strengthening of his hemispherical leadership. ASUNCIÓN — ABC Color (Independent), Paraguay, Nov. 4: [The summit will be] a waste of time and money … if the heads of state attempt to firmly wage a “war on poverty” by signing important documents with proposals to create decent employment, strengthen democratic governance and other policies while ignoring the principal cause of poverty in the hemisphere: the general situation (of a hemisphere) of corrupt governments. An effective hemispheric alliance to prosecute and do away with corruption … would have an enormous and enduringly positive impact on the economy, employment, the stability and democracy in the hemisphere, above all in the poorest countries, like Paraguay. TORONTO — National Post (Conservative), Canada, Nov. 5: The 34 Western hemispheric leaders gathered in Mar del Plata, Argentina, this weekend for the fourth Summit of the Americas will take a crack at reviving the F.T.A.A. — a Nafta-like treaty that would encompass all of North, Central and South America. But few expect the meetings to amount to anything. Free trade in the region is such a low priority, it was not even on the summit agenda until earlier this week. There is no will to make this treaty happen. And maybe that is not such a bad thing … Canada and the United States will be pressured to make major concessions in order to kick-start negotiations. But the project is not urgent enough to justify such sacrifices. Many of the signatories have little in the way of resources, manufactured goods or agricultural fare that Canada needs, and they are too poor or too small to buy much from us. The Americans already have one-on-one agreements with Costa Rica, El Salvador, Guatemala, Honduras, Nicaragua and the Dominican Republic. And we have successful pacts with Costa Rica and Chile. Most of these are working extremely well for both sides. MEXICO CITY — Reforma (Independent), Mexico, Nov. 7: The Summit of the Americas in Mar del Plata ended amidst disagreements. It was actually the first time in 11 years that the 34 hemispheric nations were unable to agree on how to promote the F.T.A. negotiations. What we are about to witness — if next year’s ministerial fails — is for the continent to be divided between the block formed by Brazil, Argentina, Venezuela, Paraguay and Uruguay, and the block of the rest of hemispheric nations … Brazil and its neighbors are right in demanding a reduction in the obscene U.S. agricultural subsidies. It is o.k. if their behavior at the Summit was to hold a better negotiating ground. However, their officials would only be dreaming if they think they can compete in the world economy and to reduce poverty without having preferential access to the world’s largest economy. The importance of these nations would diminish while their poverty levels would increase. BUENOS AIRES — Buenos Aires Herald (Liberal), Argentina, Nov. 8: The U.S. clearly lost from the lack of consensus over F.T.A.A. but those blocking the consensus — chiefly the Mercosur countries and Venezuela — also emerged as losers because they stood alone in a hemisphere where almost everybody yearns for F.T.A.A. U.S. President Bush might be unloved in Latin America but Venezuelan President Chávez was a far more isolated figure beyond the protest throng of 40,000 … The host must shoulder his responsibility for the failure of any party and the Mar del Plata Summit was no exception. 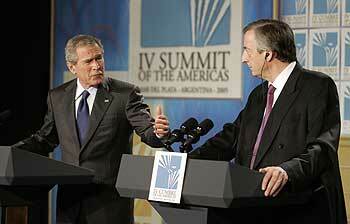 If everybody lost, it was partly because President Kirchner — torn between Bush (his chief support in debt talks) and Chávez (his main oil supplier) — lacked the hemispheric vision or the diplomatic skill (especially with an improvised, lame duck foreign minister) to throw the chairman’s weight behind anybody or to steer the agenda in a more promising direction. SANTIAGO — La Tercera (Conservative), Chile, Nov. 14: It is true that the United States is not the country with the worse record in terms of agricultural protectionism … but it is also true that if the U.S. wishes to improve relations with its southern neighbors it must make important concessions … Unfortunately the lack of progress on free trade matters is not the only element hurting relations between the United States and Latin America … Very few Latin American countries endorsed the war on Iraq … and most governments in the region are becoming increasingly critical of the Bush administration’s foreign policy … Furthermore, a growing number is moving to the left and Hugo Chávez … is gaining more popularity … People are also becoming increasingly skeptical of market-oriented policies and of globalization, which means that in the next few years … the region will be less open to foreign investment, especially to U.S. economic interests. It’s not too late for the U.S. to recover its political influence in Latin America. To improve relations with its southern neighbors … the U.S. must decrease agricultural protection … make sure that its immigration reform protects Latin American immigrants, and support Latin American representation to international entities such as the World Bank or the I.M.F. These initiatives would show that despite appearances … the Bush administration and the United States have not put the region totally aside. Viewpoints includes items drawn from the U.S. Department of State’s daily digest of international media opinion.